The drive for sterilization warps in healthcare facilities stems from the intense need for adopting effective infection control methods world over. Sterilization wraps play a crucial role in ensuring better infection control among patients by providing excellent barrier control against a variety of contamination. This is a key factor underpinning their demand. 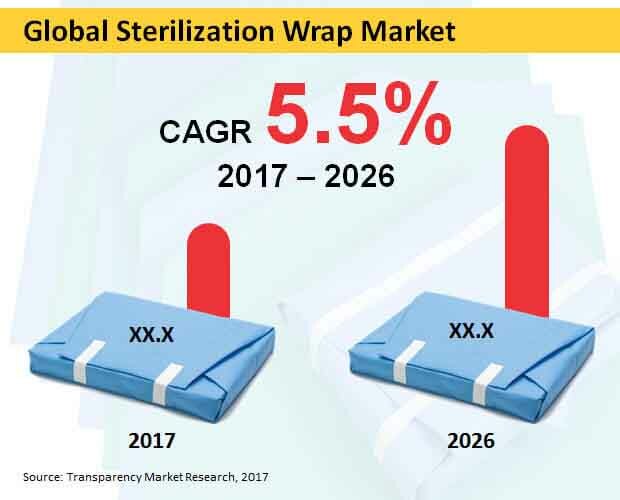 The rising demand for these sterilization wraps among clinicians in various developing and developed regions is a significant factor driving the overall market. This is in part attributed to the stringent implementation of government regulations on control of hospital-acquired infections and the spread of infectious diseases. Moreover, the growing awareness about infectious diseases caused by poor hygiene in hospitals is also bolstering the demand for sterilization wraps. The study presented here is based on a report by Transparency Market Research (TMR) titled “Sterilization Wrap Market - (Product Type - Plastic and Polymers and Paper and Paperboard; End User - Hospitals, Ambulatory Surgical Centers, and Clinics; Sales Channel - Hospital Pharmacies, Retail Pharmacies, and Online Sales) - Global Industry Analysis, Share, Size, Growth, Trends and Forecast 2017–2026”.